TEDMED is a community of people who are passionate about imagining the future of health and medicine. Once a year, TEDMED holds a "grand gathering" where leaders from all sectors of society come together for three and a half days. They explore the promise of technology and the potential of human achievement. This unique event combines dazzling celebration, high-powered learning and unforgettable theater. Production requirements were intensive. Six HD cameras (several with long lenses plus one jib) were positioned around the Opera House. Other sources were digital playbacks and graphic presentations. Destinations include a web stream, satellite uplinks, and a vast array of monitors around the venue and activity tent erected outside. Above the stage was a large screen plus a backdrop containing projected animations. Alt Gobo’s Peter Roof’s function was camera video control shading all cameras and facilitating the routing of the sources/desinations. 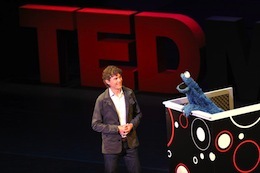 The photo, courtesy TEDMED Facebook page, shows a dialog about nutrition between ultra-marathon champion Scott Jurek and Sesame Street’s Cookie Monster.